Below sections of sentence are provided with five options. All the four options are the ways to combine the sections of the sentence and frame it into one single sentence. 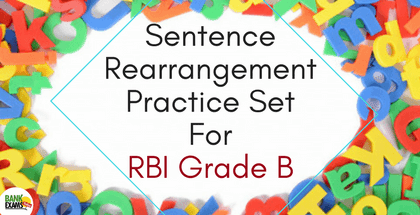 You need to find out the best option which is contextually and grammatically correct and if none of the given sentences is correct to mark ‘none of these’ as your answer. a. Entering in its second month, the Doklam military standoff in the China-India-Bhutan tri-junction, memories of a border war in 1962 have stirred back to life. b. As the Doklam military standoff in the China-India-Bhutan tri-junction enters its second month, the memories of a border war in 1962 have been stirring back to life. c. The Doklam military standoff in the China-India-Bhutan tri-junction enters in its second month so the memories of a border war in 1962 have been stirred back to life. d. While the Doklam military standoff in the China-India-Bhutan tri-junction enters in its second month, the memories of a border war in 1962 have been stirring back to life. Solution: B in the second part of the sentence has/have been +ing will be used as the memories continued to stir back to life so present perfect continuous should be used which clearly eliminate A and C option. In D option has been is grammatically incorrect as has been cannot be used with memories. Hence option B is grammatically and logically correct. Excessive workloads / the government has pledged/ to reduce are getting worse/ a result of funding cuts. a.Excessive workloads are getting worse as a result of funding cuts, which the government has pledged to reduce. b. Excessive workloads, where the government has pledged to reduce, are getting worse as a result of funding cuts. c. The government has pledged to reduce the excessive workloads, are getting worse as a result of funding cuts. d. Excessive workloads, which the government has pledged to reduce, are getting worse as a result of funding cuts. Solution: D in the sentence government has pledged the reduction for excessive workloads but in A the position of the comma changes the meaning of the sentence in B the usage of where is concisely wrong and in C again the wrong position of the comma changes the meaning but D sentence is grammatically and logically correct. Many respondents feared/ funding pressures would mean/ less support for students/ have additional learning needs. a. Many respondents feared that funding pressures would mean less support for students who have additional learning needs. b. Many respondents feared by funding pressures would mean that less support for students whom have additional learning needs. c. Many respondents feared where funding pressures would mean less support for students which have additional learning needs. d. Many respondents fearing that funding pressures would mean less support for students who have additional learning needs. The good news is/ teachers can learn to combat their prejudice/ even the implicit kind/ they become more aware of it/ take steps to actively fight it in themselves. a.The good news is that teachers could have learnt to combat their prejudice even the implicit kind, when they become more aware of it and take steps to actively fight it in themselves. b. Teachers can learn to combat their prejudice, even the implicit kind when they become more aware of it so they take steps to actively fight it in themselves. c. The good news is that teachers can learn to combat their prejudice, even the implicit kind, if they become more aware of it and take steps to actively fight it in themselves. d. Being good news, teachers can learn to combat their prejudice, if they become more aware of it and take steps to actively fight it in themselves, even the implicit kind. Solution: C in A use of could have is wrong as it is the simple conditional sentence. In B use of so changes the meaning of sentence and in D the introductory section being good news is logically wrong. Hence C is the correct choice. Pretending to be colour-blind/ not helpful and in fact adhering to a colour-blind philosophy/ has been shown to increase implicit bias/ at least in college students. a.Pretending to be colour-blind is not helpful and in fact, adhering to a colour-blind philosophy has been shown to increase implicit bias, at least in college students. b. Pretending to be colour-blind will not be helpful and in fact adhering to a colour-blind philosophy which has been shown to increase implicit bias at least in college students. c. At least in college students, it is not helpful to be colour-blind and adhering to a colour-blind philosophy to increase implicit bias. d.To pretend to be colour-blind is not helpful and at least for college students, it increases implicit bias to adhere to a colour-blind philosophy. It’s important to take steps in the classroom/ the relationships we form/ outside of the classroom/ also have an impact on bias. a.While it’s important to take steps in the classroom, the relationships we form outside of the classroom can also have an impact on bias. b. As it’s important to take steps in the classroom, the relationships we form outside of the classroom would also have an impact on bias. c. Even though it’s important to take steps in the classroom, the relationships we form outside of the classroom does not have an impact on bias. Solution: E in C use of does not changed the meaning of sentence whereas A and B are logically and grammatically correct so the option D is the right choice. The Fed will continue to raise interest rates/ government cannot continue like this/ negative interest rates in most parts of the world/ destroy a lot of people. a.The Fed will continue to raise interest rates—government cannot continue like this—negative interest rates in most parts of the world are destroying a lot of people. b. Government cannot continue like this because negative interest rates in most parts of the world have destroyed a lot of people and The Fed will continue to raise interest rates. c. The Fed will continue to raise interest rates until government can continue like this but negative interest rates in most parts of the world are destroying a lot of people.